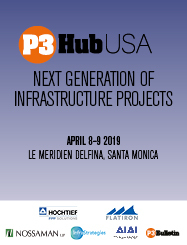 P3 Bulletin is delighted to announce the next P3 Hub event which will cover innovation in partnerships across the whole of the United States and will take place in Santa Monica, LA on April 8 - 9 2019. Focusing on innovation in public-private partnerships, this is the latest event using our fresh style of conferencing - short targeted seminars, roundtables, boardroom and plenary sessions. The conference agenda will be curated to share examples of best practice and look at the current and next generation of infrastructure partnership models in the USA. The event aims to bring together leading public and private sector infrastructure leaders to present examples of best practice, and discuss how these innovations can be applied to new and existing infrastructure through P3s in the USA.